Much has been written about the Dutch foundations upon which the modern Barcelona has been built. The presence of the great Johan Cruyff remains palpable around the Camp Nou and La Masia. Cruyff’s sacred principles have left an eternal mark on Barcelona, a merging of Dutch principles and Catalan culture. “Treat the ball well, let it be your friend.” This guiding idea eventually formulated the basis for his protégé Pep Guardiola’s all-conquering, possession-based football. Before that, Cruyff’s 1992 European Cup-winning team, epitomised by the indomitable Ronald Koeman, embodied the first cycle in the evolution of the Barcelona way. The pragmatism of Louis van Gaal brought further success, with back-to-back league titles delivered at the end of the decade. And by 2003, it was the turn of Frank Rijkaard to restore the club to the summit of European football. To do so, he would quickly turn to another Dutchman: Edgar Davids. Today, such is the ubiquitous impact of Barcelona’s decade-long success in European football, it’s difficult to remember any different. Looking back to the bleak winter of their 2003/04 season, however, no-one could have predicted the revolutionary era that was to follow. Before a Ronaldinho-inspired side lifted the Champions League in 2006, and before Xavi and Andrés Iniesta’s captivating carousel took flight, Barça were stuck in a rut, drifting in the shadows of the Galácticos of Real Madrid and a resurgent Valencia. 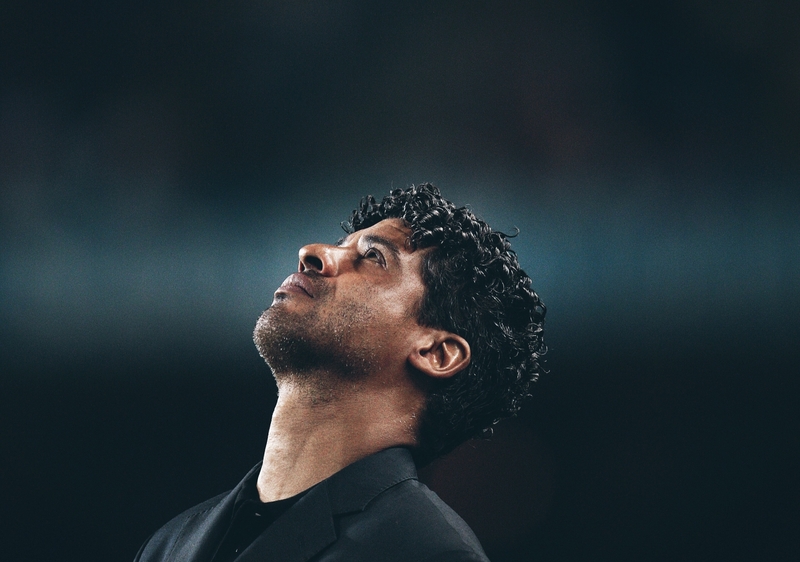 Without a LaLiga title since 1999, Rijkaard’s first season in charge was quickly unravelling into acrimony. In early December 2003, a Ronaldo-inspired Real consigned an insipid Barcelona to defeat at the Camp Nou in the first Clásico of the season, making it a paltry five wins from their first 15 league games and leaving them languishing in seventh place. Commercially, they were also losing ground to their old rivals. The previous summer had been defined by the politically-charged pursuit of David Beckham, whose eventual transfer from Manchester United to Real scarred the new presidency of Joan Laporta and further skewed public perception that Real reigned as kings of Spain. Inevitably, the pressure was building on Rijkaard. On paper, the bones of a great team were already in place. The individual brilliance of Ronaldinho and Xavi was complimented by the colossal Carles Puyol behind them, with the attack spearheaded by the elegant Patrick Kluivert and razor-sharp Javier Saviola. But the balance of the team was wrong. The ageing Luis Enrique and Phillip Cocu, valiant servants from the previous era, were now overrun and unable to provide authority and protection from central midfield. Without a solid base to launch attacks from, Ronaldinho and Luis García were increasingly forced deeper to search for the ball, with Xavi progressively starved of possession and unable to exert control. Concurrently, at Juventus, Edgar Davids was stuck in a rut of his own. After six highly successful seasons at the Stadio Delle Alpi, his place at the base of a midfield diamond had been handed to new signing Stephen Appiah, deemed a fresh alternative by head coach Marcello Lippi. As a result, the 30-year-old was surplus to requirements. Starved of game time and rotting on the bench, Davids was a caged pit bull desperate for release. Sensing a mutual requirement, Rijkaard made his move at the mid-point of the season. Stepping off the plane from Turin, he may as well have been beamed down from a spaceship. Before we grew accustomed to the brand-building bravado of the likes of Neymar and Paul Pogba, Davids was a pioneer of the outlandish-looking footballer. 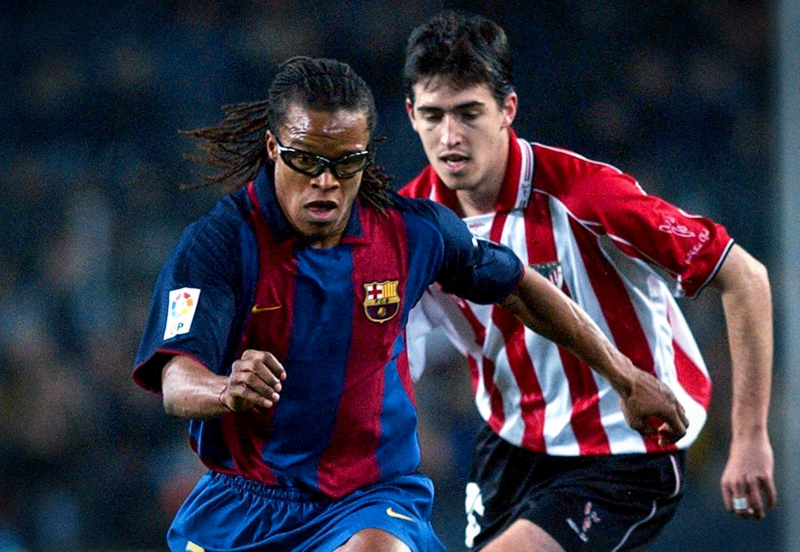 With his futuristic, orange-tinted wraparound goggles and long dreadlocks, he didn’t fit the mould of the archetypal Barcelona midfielder. 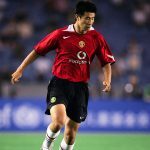 Here was a uniquely modern footballer; the antithesis to Iniesta’s choirboy, a sci-fi Roy of the Rovers. After 19 games in LaLiga, Barcelona remained in seventh, up five places from 12th following a 3-0 win over Zaragoza. Under Rijkaard, the team was still drifting and in desperate need of traction. On 17 January 2004, Atletico Club arrived at the Camp Nou for Davids’ debut. A 1-1 draw was not ideal, but there were signs that something was beginning to change. The pit bull had been released, tearing into midfield with tenacious competitiveness, finally providing protection to a previously exposed defence. Davids had added bite and a backbone to a previously ragged midfield. A customary yellow card was to become his trademark throughout his short tenure in Catalonia. Steadily, results began to pick up. A 1-0 win away at Sevilla was the start of a nine-game winning streak, catapulting Barcelona to third in LaLiga. Following that win in Seville, a 5-0 thumping of Albacete at home delivered Davids’ first and only goal in Barça colours. With an irascible and belligerent playing style, he stood in contrast to the possession-based ideals of Cruyff and Guardiola, and yet complemented the team perfectly. In their first 19 league games of the season, the side had shipped 25 goals. Following Davids’ introduction, this decreased to 14 over the course of the rest of the season. The impact on these defensive frailties was evident, but it was the cumulative effect on the balance of the team that was most startling. Attacking output increased from 26 goals in the first of the season to 37 in the second. A red card in a 3-1 home win against Atlético Madrid two weeks later was par for the course. Upon his return, Barcelona edged a pivotal match at title-chasing Deportivo 3-2. The flourishing Ronaldinho ran riot to score twice, playing with the freedom and creativity which had been lacking in the first half of the season. With Davids sitting behind the midfield snuffing out attacks, the supply line from defence to attack was transformed. With Xavi newly released from destruction duties, he was able to grow into his role of conductor and exert control, receiving the balls Davids had won back and immediately looking to feed the star men at the top of the pitch. No longer forced deep from wide left to search for the ball, Ronaldinho was now able to push up more centrally off the forward, occupying the left-forward role which would become his mainstay over the coming years. Barcelona’s flair players were a match for anyone in Europe. And now physically, they were becoming more resilient with each passing game. With their soft centre hardened, teams were no longer able to kick them out of matches, knowing Davids was constantly lurking to take retribution. The unbeaten run continued, with the following seven games yielding five wins. Next up was a crucial meeting with Real Madrid at the Bernabéu, in a match which has come to signify the defining contribution of Davids’ short time in Barcelona, and a marker in the sand of the team’s progress following their tepid display in December’s reverse fixture. Directly up against Davids was Zinedine Zidane, still the jewel in the Galáctico crown and the best attacking midfield force on the planet. Davids hassled and harangued his former teammate like a starving hyena, containing his influence and consistently forcing turnovers. With the Dutchman driving the team forward from the base of midfield and disrupting the rhythm of Real’s attacks, the spine which was missing in December was now firmly in place. An 86th-minute winner from the liberated Xavi was emblematic of the reign which would follow – Barcelona’s passing prince would become the scourge of Real for the next decade. An unbeaten streak of 15 games came to an end with defeat at Celta Vigo, before they closed out the season with a win against Racing Santander and a defeat on the final day at Zaragoza. They fell short of the title by five points, as Rafa Benítez’s Valencia hung onto top spot to add to their UEFA Cup victory. Ultimately, Davids’ stay in Catalonia was brief. Following the end of the season, he moved on to Internazionale. 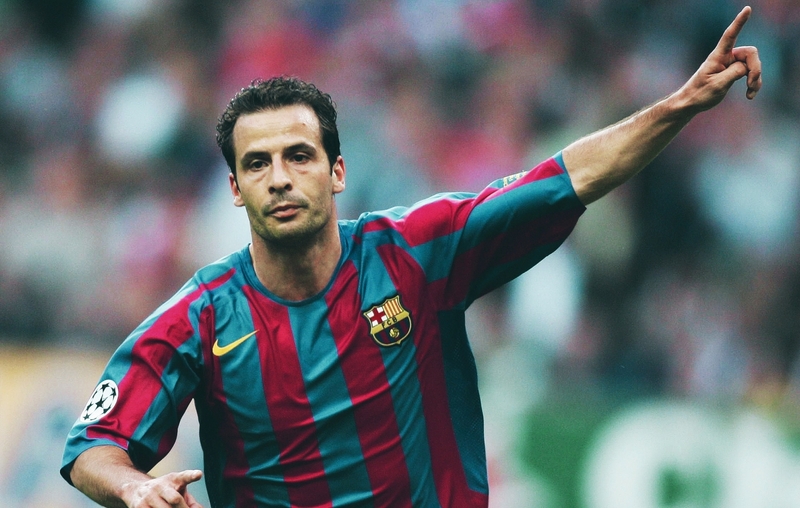 His time at Barcelona would prove to be the last major contribution he made to a heavyweight club, with relatively uninspiring subsequent spells at Spurs, Ajax, Crystal Palace and, most peculiarly, Barnet. For Barcelona, 14 wins and two losses across 19 games represented a worthwhile gamble by Rijkaard. Whilst the short-term impact of Davids on their season cannot be disputed, his role as a catalyst for the era of dominance that followed is less recognised. Following Davids’ cameo in the team from January to May, the importance of balancing midfield creativity with defensive attrition became evident. The liberation of Xavi after Davids’ arrival, coupled with the emergence of Iniesta, represented the future fulcrum of the Barcelona midfield. To enable the likes of Xavi, Iniesta, Deco and Ludovic Giuly to flourish, it was clear an enforcer was paramount to allowing this dynamic to grow. Destruction in the midst of beauty. Over the next few seasons, they continued to deploy a holding midfielder with varying degrees of success. Tiago Motta, Edmílson and, perhaps most notably, Mark van Bommel, all inhabited the role as Barcelona’s number six. Although it wasn’t conducive to the free-flowing tiki-taka that was to follow, this approach produced a first Champions League crown since Cruyff’s 1992 triumph, with Edmílson and then Van Bommel alternating the position throughout the 2005/06 season. Back-to-back LaLiga titles in the two seasons following Davids’ departure were also secured from the platform he helped construct. After taking the reins, Guardiola’s immediate promotion of Sergio Busquets from the B team further redefined the position of the holding midfielder and ushered in the Messi era, ultimately yielding a further three Champions League titles. For Davids, his four months at the Nou Camp were the stage upon which he proved the enduring impact of utilising a holding midfield player. Barcelona’s subsequent era of success means his impact has transcended modern football, with midfielders less recognised as box-to-box and now more specialised in a certain role, progressing into the consolidated emergence of defensive and attacking midfielders and a clear distinction between number six and number 10. For Barcelona, Davids proved the importance of excelling without the ball as well as with it – his style evident in the way in which Xavi and Iniesta began to harry and press immediately after losing possession. But arguably Davids’ biggest contribution was mental. Following his loan spell, Barcelona were finally able to regain a competitive edge on the pitch, with an internal drive now fuelling the obvious external talents of the likes of Ronaldinho and Xavi. As far as loan spells go, this may be the most successful – at least the most defining – in the history of the game. Considering what followed, Davids is the pit bull who kick-started a revolution.